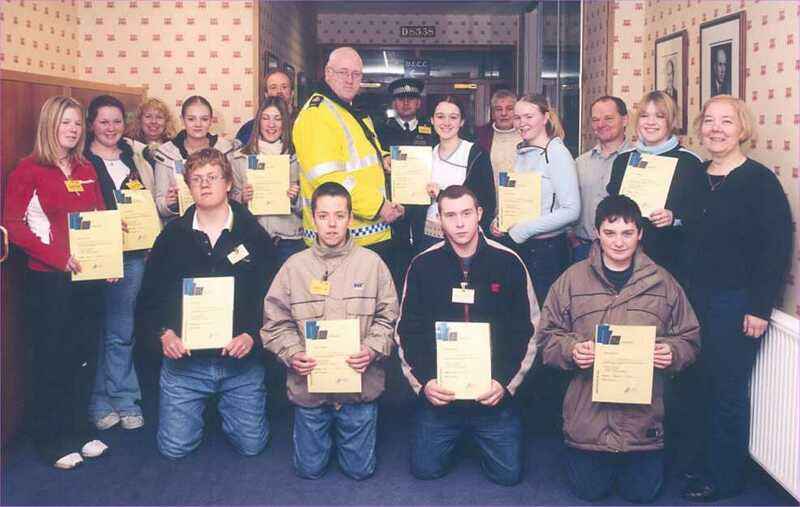 The latest course of First Gear, the training programme for pre-learner drivers aged 16 and 17, drew to its conclusion recently at UKAEA Dounreay with the presentation of certificates to the young people who had successfully completed the latest course, by PC Phil Williams-Blake of the UKAEA Constabulary. First Gear aims to encourage positive attitudes not only towards driving a car, but also the ownership and maintenance. It also promotes a correct attitude to other road users. Included in the course were the all important 3 sessions of driving which were conducted on the 'off-road' site at Dounreay. UKAEA also generously provided accommodation and refreshments for the course, under the careful watch of local driving instructors Nicola Mowat (Driver Training) and John Duffield (Leaview Driving Academy). The UKAEA Fire Service organised an 'accident' scenario where they demonstrated how an injured driver would be cut out of a motor vehicle following a road accident. Also included were talks by Police Constables Allan Loomes and James Munro of the Northern Constabulary and visits to Wick & Thurso Police Stations, which included a visit to the Sheriff Court. The visit to Wick Fire Station was again one of the highlights of the course. Extra time was allocated due to the popularity of the previous visit and Station Officer Gordon Cook gave a very informative talk to the young people followed by a look around the station, the equipment used and the fire appliances. The programme was co-ordinated and presented by Brian Lavery of Community Learning and Leisure Service, Wick and Diane Gibson of Youth Clubs Caithness. The 12 young people who completed the course and received their certificates were, Kelly Allan, Michelle Suttar, Michelle McCarthy, Michelle Swanson, Fiona Topping, Carie Gunn, Claire Treasurer, Eoghan Spiers, Stuart Coghill, Graeme Cameron, Graham Sutherland, and Jan F de Muijnch-Hughes.